This beef tater tot casserole is a super easy dinner recipe that your whole family will love! Crispy tots on the top with a gravy and beef filling inside! Add the oil to a large skillet over medium heat. Brown the onions with the garlic for 5 minutes, stirring often until softened. Add the beef to the skillet, breaking up with a spoon and cooking until no pink remains, about 7-8 minutes. Drain any grease from the skillet then add the salt, pepper, worcestershire sauce and tomato paste and stir to combine. Pour in the gravy and stir into the beef mixture. Bring the beef to a simmer then add the frozen peas and carrots. Stir to combine with the filling and to defrost slightly. Pour the filling into a 9″ x 13″ casserole dish that’s been sprayed with cooking spray. 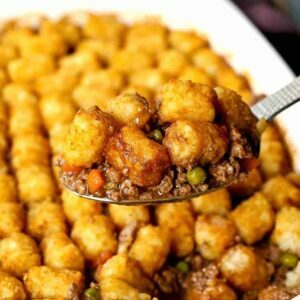 Add the frozen tater tots on top of the beef filling, arranging in a single layer. Bake for 35 minutes until the tater tots are golden brown and the filling is bubbling.